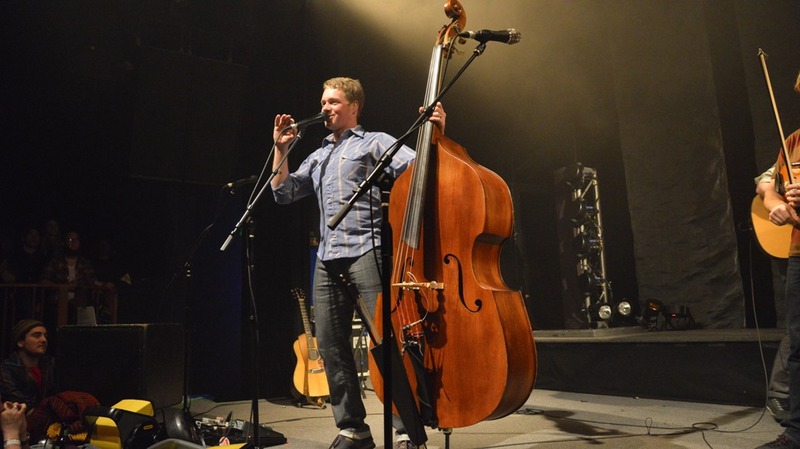 At the second stop on their Ski Tour through Colorado, the Infamous Stringdusters used their first night at the Fox to make an extremely compelling case for the audience to return for the second show on Saturday. 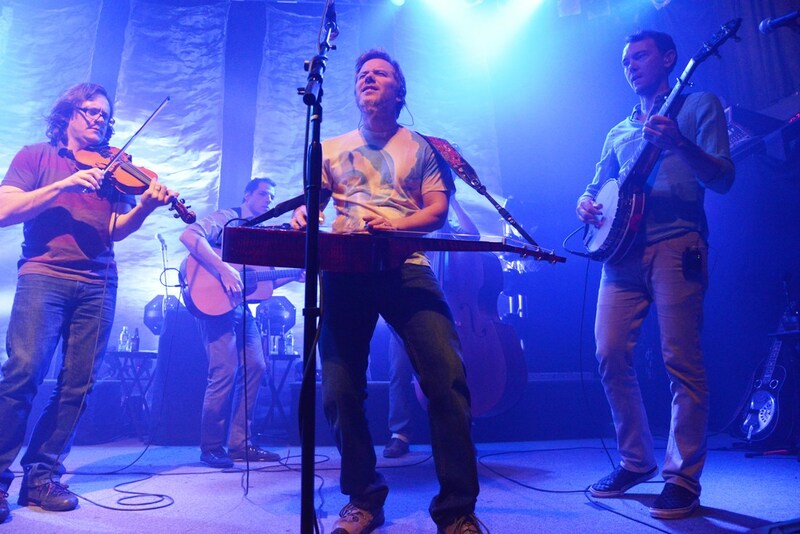 Seamlessly combining soaring solos with impressive stage dynamics and powerful songwriting, The Stringdusters left the capacity crowd in a sweaty, euphoric state. The openers, Waiting on Trial, did a respectable job of priming the audience. The band, hailing from Durango, was clearly excited to be playing the Fox for the first time. All the members have one of the tricks of being a successful bluegrass band down: strong facial hair. Chris Lane, on banjo, displayed serious chops both musically and stylistically, with sideburns that would rival Weapon X, aka Wolverine. They stuck to mostly original material, and their songs were always competent and more often than not downright decent. The only cover came courtesy of (surprisingly) Social Distortion. Robin Davis, the mandolin player, sang a terrific bluegrass version of “Diamond in the Rough,” a newer song off 2011’s Hard Times and Nursery Rhymes. The Infamous Stringdusters began their first set right around 10:15. Immediately, the chemistry between all the members was apparent. 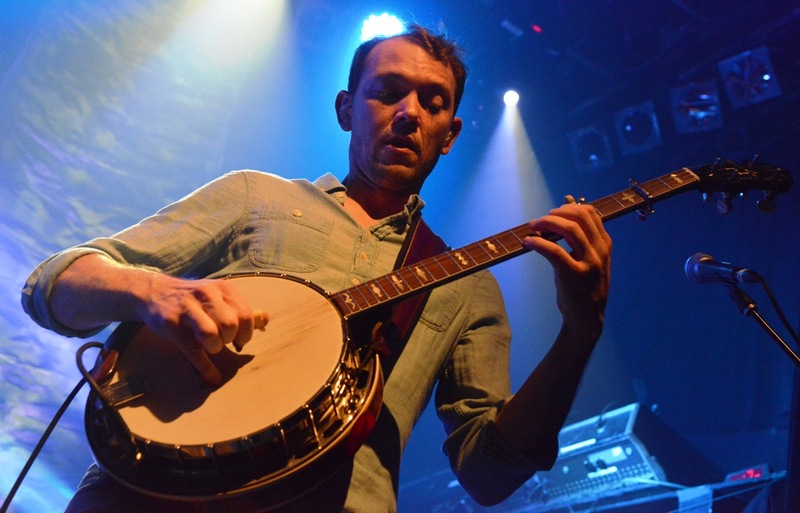 One of the first songs they played was “Night on the River,” off their most recent album Silver Sky, followed by Andy Hall singing “Well Well.” It was on this song that The Stringdusters really began to find their groove, as Hall’s superb dobro led into an epic guitar solo from Andy Falco. The long, trance-like jam really showcased Falco’s flat-picking, which really was second to none that night. That was followed up with a bit of a pander job. I don’t know the name of the song, but I do know it included the word “Colorado” roughly 75 times. It wasn’t a bad tune, and the crowd ate it up. The Stringdusters really seem to have found their niche in this great state, so I don’t have any problem if they want to show love for it. The first set also included a couple of instrumentals, which is where The Stringdusters truly shine. Every single one of them is an accomplished musician, and their stage presence is incredible. I particularly liked how when it was time for one person to solo, the rest of the band would move around on stage and center around whoever’s turn it was. It gave the impression that they were playing traditionally around a single microphone, but everyone was plugged in and loud. Moving on stage also demonstrated their willingness to make it about the band, not an individual. By highlighting everyone who was playing, they made the idea of a front man irrelevant. All the band members sang songs throughout the night, but during the second set it seemed Travis Book, the bassist, was getting the majority of them. Some of the ones he sang included the John Hartford cover “Keep on Truckin’” and “He’s Gone” by the Grateful Dead, which the Boulder crowd enthusiastically sang along to. Other second set highlights included “Long and Lonesome Day,” “17 Cents,” and “Ain’t Know Way Of Knowing.” However, the best part of the second set (besides “He’s Gone”) had to have been “No More to Leave You Behind.” The song eventually delved into a banjo-and-fiddle jam of “Salt Creek,” which banjo player Chris Pandolfi nailed. After a lengthy instrumental to end the second set, the band came out for a one song encore, the always-appreciated Hartford number “Steam-Powered Aeroplane.” With that, the first night was over. The weary crowd shuffled to the exit, tired but no doubt excited about what The Infamous Stringdusters would bring the next night.